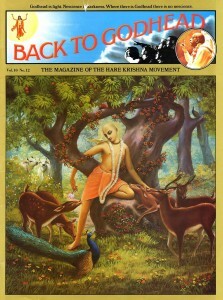 Back to Godhead > ISKCON > Letters > Letters: What about other Gurus? Letters: What about other Gurus? The editors of BACK TO GODHEAD welcome correspondence pertaining to spiritual enlightenment. All letters will receive personal replies, and correspondence of general interest will he published regularly. It has been one year since I received my copy of Bhagavad-gita As It Is from your mail-order department. Since then I have read it through twice and am almost through it again. It is the kind of book that fascinates me. And to one of my tendencies it speaks a thoroughly understandable message. Strangely, from childhood up I have never felt at home in my own culture. The material things that so fascinate our people leave me cold and always have. I understand perfectly the purport of the Gita’s great discipline, and if I weren’t so old (over eighty-one) I could integrate myself quite well with its philosophy. It is so satisfyingly complete—ancient, yet as modern as today. It is an awesome, ageless wonder. All my reading, for the brief time allotted me, will be from the Gita, be assured. Enclosed is my check for a subscription to your BACK TO GODHEAD magazine. The last issue I received was from some devotees who tarried here for a while in 1973. Thank you for your very kind letter. We are most pleased to have you as a subscriber to BACK TO GODHEAD. By submissively hearing the message of Bhagavad-gita As It Is, you are already integrating yourself with the Gita’s philosophy. As Lord Krishna says, “And I declare that he who studies this sacred conversation worships me by his intelligence.” (Bg. 18.70) The sincere sentiment you so nicely express in your letter proves that age is no barrier to Krishna consciousness. Let me offer my praise and thanks to you for your efforts in spreading love of God in the Western world. In this age we are all sorely in need of spiritual enlightenment, and we have been greatly served by you. I have a question that has been troubling me. I can understand the importance you place on the exalted science of bhakti-yoga and on receiving knowledge through an unbroken chain of spiritual masters, but is there no room for other methods, other religions and other gurus ? Your question reveals a common misunderstanding that many people have about religion: that it is a creation of man and thus subject to many interpretations. Actually, religion is created by God and is, therefore, eternal and unchanging. There may be many faiths in the world—such as Christian, Muslim or Hindu—but the one immutable constant in all of them is the development of love of God through unalloyed service to Him. How to actually achieve this goal of love for God—the essence of all religion—is the science of bhakti-yoga delineated in Bhagavad-gita. To fully understand the importance of receiving knowledge through disciplic succession—a chain of authentic spiritual masters—one must first understand the importance of the Vedas. The goal of Vedic knowledge is explained by Lord Krishna in Bhagavad-gita: vedais ca sarvair aham eva vedyah. “By all the Vedas am I to be known.” (Bg. 15.15) And what is the process for knowing Krishna? In the Eighteenth Chapter, verse 55, He says: bhaktya mam abhijanati. “One can understand Me only by devotional service.” The goal of Vedic study is therefore realized by one who practices bhakti-yoga under the direction of a genuine spiritual master.